There’s something magical about lighting a chimney full of charcoal for the first time in the spring, where the dusk temperatures still dive down low enough to warrant standing closer to the grill to warm up. After a winter that saw the accumulation of over 40 inches of snow over the span of four days, the onset of afternoons filled with bright sunlight and daylight that lingers ever longer into the dinner hour brings a sense of hope and renewal. Grilling is almost a natural reaction to those times when I don’t feel like cooking. When the kitchen is clean, and I don’t want to disturb its serenity by breaking out all manner of pots, pans, and plates, I grill. Likewise, when the kitchen is dirty or cluttered – again, with those pots, pans, and plates that were all called into the service of some multifaceted meal, I grill. For me, grilling distills cooking down to its primal elements – meat and fire. Really, what else do you need? On the occasion of discovering perhaps the most perfect butcher shop in all of Chester County, we came home that day with a perfect Delmonico steak – well marbled throughout with streaks of fat. The shop in question, Country Butcher in Kennett Square, sells USDA Prime cuts that are locally sourced and grass-fed, along with a good selection of cheeses, oils, and other food items. Out of respect for this grand specimen of beef, I treated it simply – a little bit of olive oil, a sprinkle of sea salt and ground pepper, and a rubdown with a cut garlic clove. Having never tried a steak from Country Butcher, I avoided masking the true flavor of the beef with overly aggressive sauces and seasonings. Having had grass-fed beef in restaurants, I was already familiar with how outstanding a good steak can become if treated well. But I had always attributed a greater portion of the responsibility to the chef than to the farmer that raised the cow and the butcher that sourced it and sold it to the restaurant. As it turns out, the steak was one of the best home-prepared dinners that we’ve ever had. I can’t take any credit for it – all I did was throw it onto the grill, stand there for five minutes, and flip it onto the other side. More tender than any other home-cooked Delmonico, with an unexpected depth of flavor, it rivaled the quality of some of the top-dollar, triple-digit dinners that we’ve had in downtown Philadelphia. It was that good. At the time that I posted my review of Maia, in June of 2008, the sprawling addition to Villanova’s dining scene was on the upswing. While I had some issues with the confusing layout of the takeout space on the first floor, the food was well-prepared, the bar and cold case had an admirable selection of craft beer, and I was looking forward to experiencing the upstairs dining room, where the considerable talents of the Feury brothers yielded, as early reviews recounted, some pretty incredible seafood dishes. Alas, a second dinner for us at Maia was not to be. By April of this year, two weeks shy of its first anniversary, Maia closed its doors. There were certainly some telling signals along the way to the restaurant’s demise – a month earlier, Maia had closed its upstairs dining room and shortened its operating hours for dinner to only three nights a week. Patrick Feury left to work full time at Nectar. Terence Feury defected to Fork, in Old City, taking eight cooks with him. Management declared that they were “reconceptualizing” the upstairs dining room and would reopen in the summer with a new chef and menu, which never happened. A renovation budget of $8 million dollars, it seems, could not guarantee Maia’s success in this economy. Maia’s loss, though, turned out to be Azie’s gain. In July, Win Signature Restaurants, which oversees an empire of Asian restaurants throughout the area, including Teikoku and Azie in Media, unveiled its second Azie location, Azie on Main, where Maia once held court, taking advantage of the former tenant’s improvements to the space. We had the opportunity to sample the menu prior to Azie’s opening during one of its Friends and Family events. With the first floor space presently unused, getting into Azie involves parking in the lot at the back of the building and entering the space through an entrance that leads directly to the upstairs dining room. 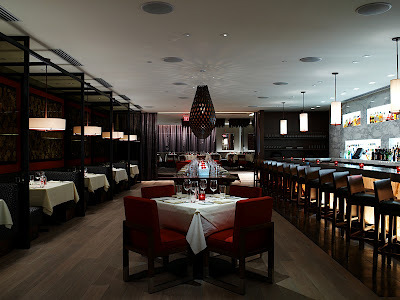 The layout of the restaurant remains largely unchanged from when it housed Maia, even down to the long table that dominates the center of the room, paralleling the bar. What Azie has done, though, is implemented its own stylish Asian design aesthetic throughout the space – subtle, yet quietly impressive. We started with one hot appetizer, the Sauteed Foie Gras with Fuji Apple Confit and Honey Balsamic, and one cold selection, the Sushi and Sashimi Sampler. There is something about the decadence of foie gras that is unmatched, and Azie does well by pairing the richness of this main component with the apple confit, which held a sweetness that countered the fattiness of the foie gras, and the occasional crunch of fruit that contrasted nicely with its velvety texture. The balsamic contributed a welcome note of sweet and sour. The sushi and sashimi sampler was a collection of tuna, salmon, and whitefish sashimi, accompanied by toro, yellowtail, and eel nigirizushi. Each piece was some of the purest, freshest seafood that I’ve ever had, and it definitely made me want to book a reservation to come back and sit at the sushi bar, just to watch the sushi chefs work their magic. We also decided to sample one of the signature sushi creations, the Azie Roll. This was a concoction of spicy tuna, scallion, and avocado, topped with eel sauce, which was then topped off with some crunchy fried tempura flakes. The flavor combination was incredible, with the spicy notes of the layer of tuna offset by the cool creaminess of the avocado and the crunch of the tempura. For our entrees, we chose the 14oz New York Strip Steak, along with the Pan Roasted Halibut accompanied by the Lobster and Cheese Risotto, and Miso Beurre Blanc. The steak arrived crusted with a nice char, perfectly cooked to order. We had requested the House Steak Sauce, and while we’re normally not impressed with steak sauces, Azie has managed to create a sauce that complements the beef while representing the restaurant beautifully. A combination of teriyaki sauce, soy, garlic, and mirin, the sauce lent just the right amount of Asian flavor without sacrificing the dish’s ability to showcase the quality of the meat. Don’t let your eyes fool you. Those are not fries on top of the halibut, they’re tempura-fried enoki mushrooms, and they were light and crisp. I find it hard to ever write about a great piece of fish, because when done right, the quality of the seafood shines best when it is prepared with respect and not subject to overly fussy techniques and preparations. The brick of perfectly prepared halibut was perched on a thick bed of risotto, with the flavor of the fish accented by a light beurre blanc with hits of earthy miso throughout. Between the steak or the halibut, I envision myself returning to try each of the seafood selections, just to see what other wonders await me. I have high hopes for Azie’s continued success. Unlike Maia, which started out of the gate under pressure of an multimillion dollar investment, Azie enters the game with far fewer burdens, and with the benefit of inheriting all of the improvements that Maia instituted. Plus, Win Signature Restaurants has already proven its ability to maintain five other restaurant properties – with the addition of Azie on Main, Win Somboonsong may very well be the Stephen Starr of the Main Line. “Steak frites, please. 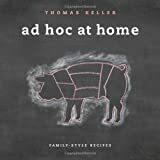 Medium rare.” The words tumbled out of my mouth with all the weight of a commandment, an incantation that would invoke the start of one of the most wonderful and highly anticipated meals of my life as a food writer so far. Was it really that good? Absolutely! Should you go there for dinner? Yes! Go right now. Take me with you. Stephen Starr opened Parc on Rittenhouse Square in downtown Philadelphia nearly a year ago, on July 14, 2008 – Bastille Day. Offering seating for close to 300 patrons, with additional space for 75 more at the sidewalk tables, Parc instantly evokes memories of its mainstay Parisian counterparts, the brasseries that remain crowded and brightly lit, stoves hot and ready to serve, well into the depths of the post-midnight hours. Having fondly missed Paris almost every day since returning from our vacation five years ago, Parc has been cemented to the top of my to-do list for a very long time. And a long time it has certainly been. I have made seven unsuccessful attempts to have dinner at Parc – that’s how many times we’ve found ourselves in Philadelphia and somehow managed to eat somewhere else, either due to convenience of location or at the behest of the people we were visiting. Our busy schedules keep us from driving down to the city “just because”, so whenever we’re in town, we’re in town for a reason. You can imagine my excitement, then, when I saw a spontaneous window of opportunity open up on Saturday, with just myself and my wife, plus the addition of the inimitable Amy Shields from the profoundly fabulous superband Mojo and the Helper Monkeys. We were hungry, we were downtown, and we had nowhere else to be – so I seized the day like an obscure 80s movie reference.. “Parc! Parc! Parc!” I shouted as we navigated the narrow streets of the City of Brotherly Love. I think I may even have made up a song about Parc along the way. I was quivering with excitement, or maybe low blood sugar – either way, we were going, at long last, to have dinner at Parc! We arrived early enough to have the fortune of being seated immediately. As we were led through the massive space, I was impressed at how authentic Parc felt – the layout, tiled floors, dark woods, and zinc bar were all reminiscent of classic bistros in Paris. We placed our drink orders, and, as I have practiced over and over in my head since first previewing the menu online, I ordered the steak frites. Listed on the menu as “seared hangar steak, maitre d’ butter”, the description is deceptively plain for a dish that, to be honest, requires a certain elevated measure of talent to pull off correctly. I’ve seen other restaurants offer steak frites, but compromise on the true interpretation by offering ribeye, or strip steak, or some other cut of beef that is more forgiving than hangar. If you’ve ever worked with it, you know that hangar steak is a naturally tough piece of meat, and if prepared inartfully, can turn a dining experience into an event only slightly better than chewing on a wallet. While we were waiting for our food to arrive, our server brought a basket filled with an assortment of bread – French baguettes, hearty wheat slices, and raisin bread, all accompanied by a crock of softened butter. The bread, baked on the premises, presents a nice array of varied textures and flavors – the crusty, chewy baguette, the thick, grainy slabs of dark bread, and the sweetness of raisins tucked into a loaf that just yearns to see you return for breakfast. The moment of truth arrived as my steak frites platter was placed in front of me. True to form, it was unmistakably hangar steak – no other cut of beef has that same muscular, fibrous quality, a look that makes you wonder if you should eat the steak or wear it as a vest. Brushed liberally with melted butter, parsley, a touch of garlic, and salt, the steak needed nothing else to become transformed into classic steak frites. I wielded my steak knife, held my fork firm, and was reassured to feel the knife glide effortlessly through the meat. Placing the first bite into my mouth, an act that I had looked forward to for close to a year, yielded an astounding burst of gamey flavor and a tenderness that approached filet mignon in its delicacy, but with the characteristic chew that can only come from true hangar steak. I’ve had steak frites in Paris; this was no mere replication of that dish, no homage – this was truly a genuine steak frites in every sense. The fries, slender, golden, dusted with sea salt, were served with an aioli for dipping. The plate oozed with decadence, each bite as rewarding, flavorful, and satisfying as the first. And, just like that, it was gone. Other dishes proved just as skillfully executed and true to form. A Trout Amandine presented perfectly cooked, delicate white flesh, adorned with slivers of almond toasted in butter and a splash of lemon. Unapologetically French, there is little on the menu at Parc that would classify as light fare – even a Salade Lyonnaise comes draped with a poached egg. But the poached egg is not alone, as it’s paired with lardons, that wonderful gift of salty, smokey pork fat. It’s bacon taken to the next level and beyond. As is typical with any outstanding restaurant experience, I’ve already assembled a mental hit list of menu items that I need to try on my next visit. As the last dish that I enjoyed before leaving Paris, it is imperative that I sample the escargot, if only to have an opportunity to relive that memory again. A charcuterie platter was a generous pile of cured meats, accompanied by pate and chicken liver mousse, presented on a wooden cutting board. The onion soup gratinee, along with a glass of wine, would make for a wonderful midday lunch. And was that steak tartare that I spied on an adjoining table? No Connection. Try hitting F5 a few times, and the Twitter feed should show up.